Our Lady standing beneath the Cross is one of the most poignant scenarios in the entire Scriptures. Here is a perfect woman, one who never sinned, one who was made by God to be the Theotokos, the Mother of God, standing watching the great evil perpetrated against her son. I belong to the Third Order honoring Our Lady of Sorrows. Here is the main website. http://www.dolorans.com/ and here is the winter newsletter with good news. In the EF, in olden days, the Feast of Our Lady of Sorrows was the Friday of the Fifth Week of Lent. Now, it is September 15th, near the Feast of the Triumph of the Holy Cross. Here is my old posting on this: may you consider joining. 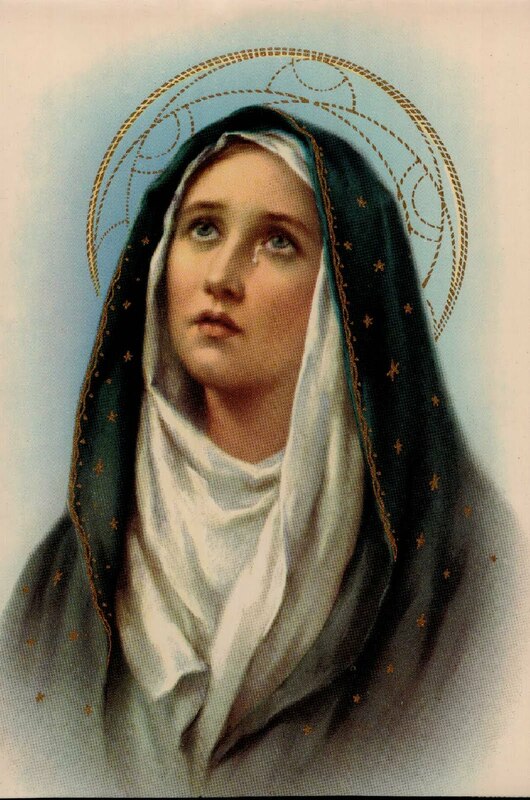 I had this holy card as a very young girl and I remember looking carefully at it. I do not know what happened to it. As our Sorrowful Mother, Mary is also the Mediatrix of All Grace and the Co-Redemptrix. I can hardly wait until the Church proclaims this title, which so many in the Church desire her to formally .